John Davis Judy Anastasio, a veterinary technician, is a recent addition to the surgery arm of Johns Hopkins Animal Resources, where she cares for the dogs, cats, monkeys, rabbits, and pigs used in research experiments. "We're here to make sure nothing happens to the animals, that they're treated correctly, that they're never in any pain," she says. Off hours, she has the well-being of humans on her mind. 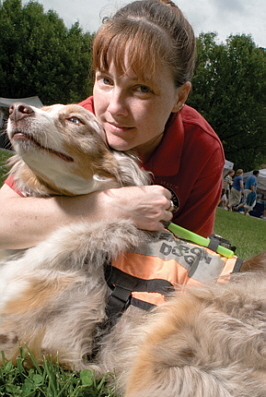 Anastasio and her 5-year-old Australian shepherd, Freedom, are part of Chesapeake Search Dogs, a volunteer organization that provides canine search-and-rescue services to federal authorities and to local police and fire departments in the Chesapeake Bay area and Southern Pennsylvania. She started volunteering as a veterinary technician with the group in 2001. One of her first trips was to the Pentagon, where, after the September 11 attacks, she made sure the dogs stayed healthy while the team searched for survivors trapped in the rubble. Back then Freedom was just a puppy — too young to join the hunt. But eventually Anastasio trained Freedom to pick up the scent of live humans, and the two started working as a team. "It's a very big-time commitment," says Anastasio, who has had to pass tests on everything from using a map and compass to CPR. And that doesn't include all the time she spends training Freedom. Not that he minds the effort. "My dog loves it," she says. Now the pair are getting trained for recovery in addition to rescue. Why does Anastasio want to search for dead bodies instead of live ones? "They need to come home, too," she says. "If something happened to my mother or one of my children, I would want them home, whether it's a good outcome or not. At least you know."